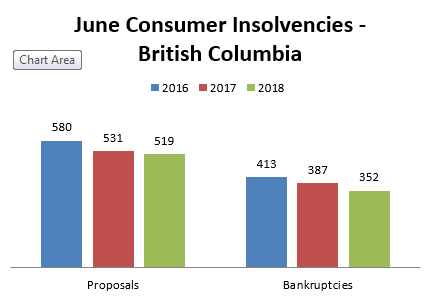 There were 871 consumer insolvency filings in British Columbia (BC) during the month of June this year, compared to 918 in June of last year. This is a 5.1% year-over-year decrease and it ends the recent two-month trend of year-over-year increases in insolvency filings BC recently experienced. For a rolling 12-month period, BC insolvency filings are down 2.0%, while Canadian filings, as a whole, are down 0.5%. The Prairies saw an uptick in insolvency filings with Manitoba, Saskatchewan and Alberta increasing by 28.6%, 7.8%, and 16.4% respectively year-over-year. These monthly increases are significantly above how these provinces are trending on a rolling 12-month average. With oil prices generally on the rise this year, it is counter intuitive that insolvency filings in the Prairies would be increasing at the same time. One the other hand, Quebec, Ontario and BC had year-over-year decreases in insolvency filings, declining by 7.8%, 3.6%, and 5.1% respectively; these declines are more negative than these provinces’ rolling 12-month average. When people have jobs, they have income and may be able to settle the debts with their creditors, as opposed to having to file an assignment in bankruptcy. When the unemployment rate is low people are more likely to receive raises and bonuses. People can use these windfalls to help fund a proposal and settle their debts without having to make significant adjustments to their monthly budgets. Once a consumer proposal is accepted by creditors, it is a binding agreement and falling behind on the proposal payments will lead to the proposal being annulled. When unemployment rates are low, people have increased job security and less chance of missing proposal payments due to unemployment. When unemployment rates are low, there are opportunities for people to advance their careers. Too often people are overly distracted with their debt and not fulfilling their career potential. Filing a consumer proposal and having a plan in place to eliminate debt can help people concentrate on their careers and families as opposed to being overly distracted by their debt. Although most people have the best of intentions when it comes to paying back their creditors, they need to assess the feasibility and decide whether they are realistically capable of doing so. Try our debt calculator to assess your different options for paying down your debts. If you’re unable to see an end and are feeling hopeless when it comes to getting a hold of your finances, it may be an appropriate time to file a consumer proposal with a Licensed Insolvency Trustee. Get in touch with one of our Licensed Insolvency Trustees today for your free, no-obligation consultation to learn how you can get on the path to becoming debt free.